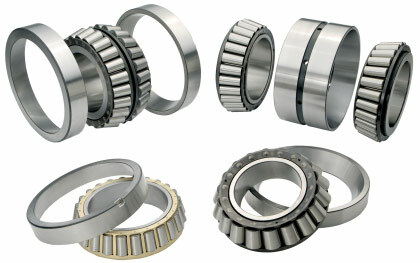 Tapered roller bearings are used in a variety of industrial applications. The tapered rollers allow the bearings to accommodate heavy radial, axial and combination loads. This loading flexibility combined with a variety of configurations can be designed from single cups, double cups and cones. This is why tapered roller bearings are designed into almost every industry. The standard cage for American Tapered Roller Bearings is a “pin-type” design that has proven to be very successful in applications that experience very high loads and high speeds. No suffix is used on our bearing number for this cage, while other types of cages have their own suffix code. American’s Tapered Roller Bearings are manufactured from the cleanest and finest commercially available AISI case hardening bearing steels. Standard tolerances conform to ABMA Classes 4 and 2, depending on size. Our size range for standard and special tapered roller bearings is 200mm (7.874 in.) to bore size 2135 mm (84 in.) O.D. TS designates the Tapered Single design utilizing one cup and one cone roller assembly. TDO designates the Tapered Double Outer design utilizing one double-cup and two single cone roller assemblies. This assembly can be complimented with a cone spacer to set a fixed range of endplay specific to the application. TDI designates the Tapered Double Inner design utilizing one double-cone roller assembly and two single cups. This assembly can be complimented with a cup spacer to set a fixed range of endplay specific to the application. TDIE designates the Tapered Double Inner Extra features design utilizing one double-cone roller assembly and two single cups. There are a variety of extra features such as bore keys, bore grooves, face slots, seals, springs, etc. TQO designates the Tapered Quad Outer design utilizing a combination of double and single components to create a four-row bearing. Standard TQO design is two TDI cones, two TS cups and one TDO cup complimented with cup and cone spacers ground to set a fixed range of endplay.